Do you love ducks? Do you love to dance? 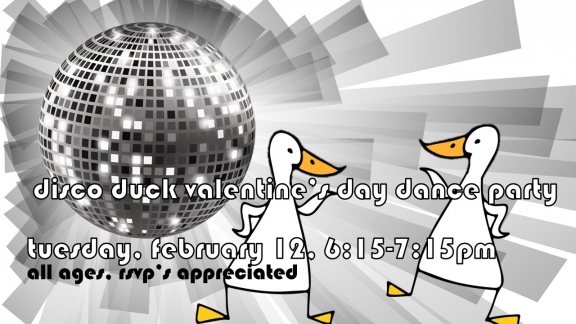 If the answer is yes, then boogie on over to the library's first ever Disco Duck Valentine's Day Dance Party! There will be disco lights, music, dancing, stories, a craft, and an opportunity to meet and cuddle with some real, live ducks! All ages. Bring the whole family! RSVPs appreciated. Registration is required for this event Registration is now CLOSED.